Milestones in Single Hair Extraction Technique: The revolutionary Hybrid Rotations and Oscillations Instrument makes FUE hair grafting of previously unseen quality possible. 'HyRO' is now available at Moser Medical. Vienna, February 2017. In the field of single-hair extraction (FUE), HyRO is the innovation of the decade. 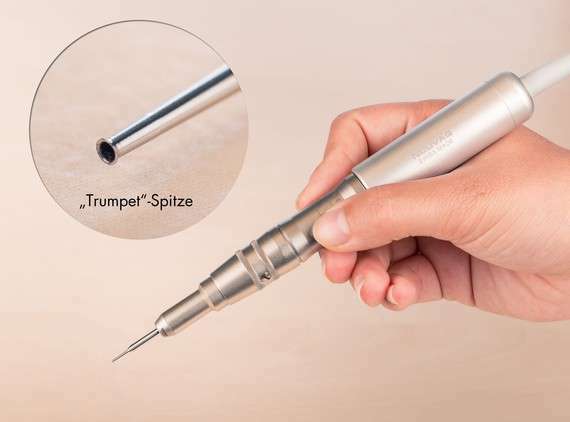 The new extraction instrument uses a 0.8-0.9 mm fine rotating and oscillating head with a trumpet-shaped opening ("trumpet"). The hair extraction with this instrument is so precisely and gently performed that the highest removal and growth rates are achieved. Benefits for patients: at Europe's number 1 clinic for hair transplantation, supported by the expert advice of our specialists, you can now choose freely between FUE and FUT extraction methods. "In the past, we only used the FUE extraction technique in select (smaller) treatments, and only when the aesthetic and medical prerequisites were in place to ensure optimal results. With classic FUE instruments, we weren't always able to achieve the level of quality that our patients' require, thanks to our own commitment to high standards. Because of this, we regularly exchange views and information with the best international clinics and doctors. And now, the time has come. FUE results are now of the highest quality possible, thanks to the HyRO extraction instrument and the expert medical treatment we provide," said Karl Moser, owner and founder of Moser Medical. Extremely gentle hair removal thanks to the rotating and oscillating trumpet-shaped head. Lower drop-out rate than any other FUE method. Plus, a higher growth rate. Better growth rate, fewer holes, fuller hair. 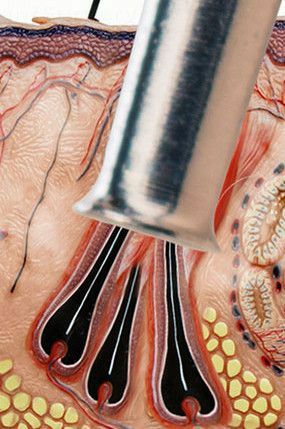 Moser Medical works with ex-vivo splitting and also prepares the hair roots precisely under the microscope after removal. They are then stored in a nutrient solution (Storage Solution) that encourages hair growth. The use of HyRO supports this by preserving the protective skin cells on the roots while they are removed. The highest precision throughout the whole process. Thanks to our large medical team of long-term employees, any number of our skilled personnel are available to patients throughout the entire treatment process. Maximum attention is ensured. Less is shaved. For the procedure, hair is required to be shaved down to 1 mm in length. With this technique, the hair that must be shaved is limited to the extraction area. » Learn more about FUE Treatment.